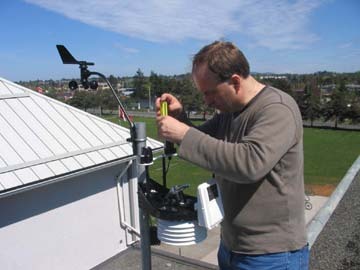 The installation of a weather station at a school is a three step process. After receiving an invitation from a school, we visit the school and consult the staff (principal, vice principal and custodian) concerning a site for the installation of the weather station. 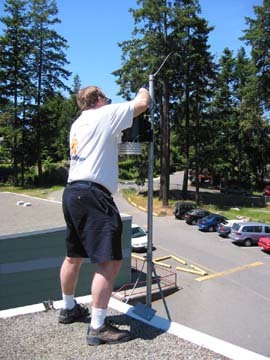 As the weather stations are solar powered, we typically try to install them on the south-facing side of a school. In addition, we try to find open, unobstructed locations so that our measurements are not affected by the presence of obstacles such as trees, telephone poles, chimneys, vents etc. Finally, we try to choose a site that is visible from the street. 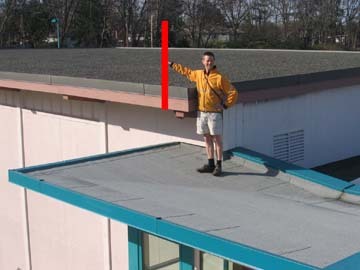 A photograph of the site is then taken (shown here for Campus View Elementary) and a pole is added in red. The photograph is then sent to the foreman in the school district facilities management. The next stage in the installation process involves us dropping off 10 foot, 1 1/2 inch EMT conduit at the School District maintenance yard. School District staff then install the pole at the site chosen in Step 1. 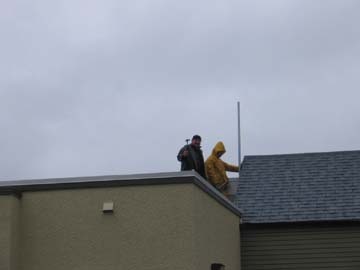 Shown here are two School District 61 staff installing the pole on Northridge Elementary during inclement weather. 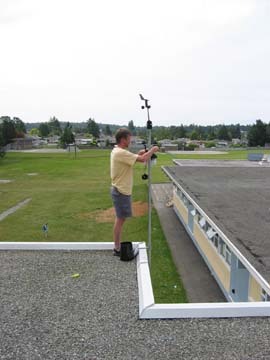 Once the pole is installed, we return to the school and install the weather station. Typically, one of us will be inside the school attaching the receiving unit to a computer (provided by us) which in turn is hooked up to the internet. Computer networking requires extensive consultation with school and district information technology staff. 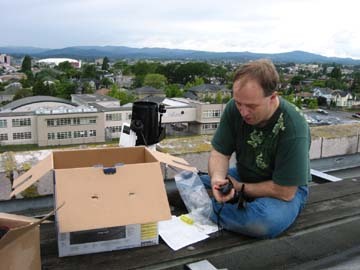 The installer on the roof communicates with the person inside to ensure that a signal is detected on the receiving unit. 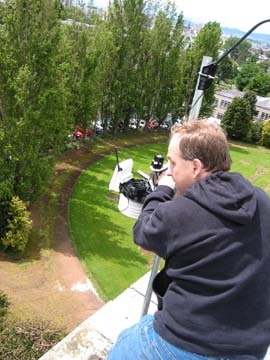 Shown here is an installation picture taken from the top of Vic High Secondary. No suitable location was found on the roof of South Park Family School. Those parts of the roof that were accessible turned out to be too sheltered or obstructed. Much of the roof was simply inaccessible or too steep. However, we received permission from the Victoria Fire Department to install the weather station on top of the communication tower at the fire hall next door. 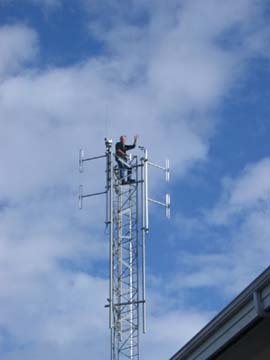 Shown here is a South Park parent installing the station on top of the communication tower. This page took 16.0 ms to generate. Last Modified: February 13 2012 15:42:25.